A Classic MIDI Key-Scan Computer is a one-board computer to which the switches on the notes of a keyboard can be connected. The computer detects the key-switches going on and off as the musician presses and releases the keys, and it translates that activity into the appropriate MIDI note on/off data. Designed as a stand-alone unit, a Classic MIDI key-scan computer provides an easy way to equip an organ with the ability to generate the MIDI data required to play voices on external MIDI devices. Mounted close to the key switches, the MKSC-1B is ideal for adding MIDI to an older keyboard. This is particularly true in keyboards with phosphor-bronze contacts because switch ‘de-bouncing’ is performed by the on-board processor. 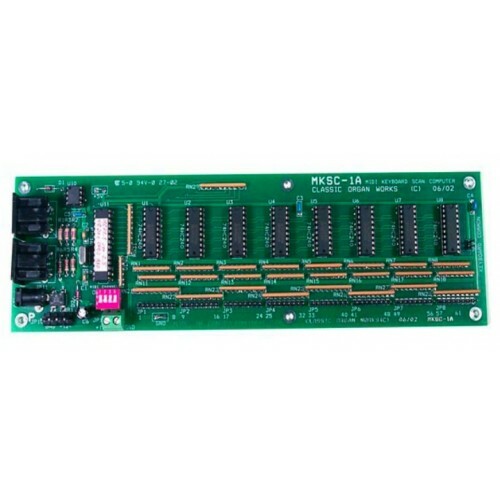 The MKSC-1B has inputs supporting a 61-note keyboard. Three additional input pins are available for functions such as stop control, to enable/disable output. Each key-scan computer transmits MIDI information on one MIDI channel. An on-board DIP-switch allows users to select one of the sixteen MIDI output channels. Multiple computers, each configured with a different MIDI channel number, may be chained together to support multi-manual organs. Messages received on the MIDI IN port are routed to the MIDI OUT port (i.e. merged). Thus, keyboards with Classic key-scan computers can be integrated conveniently with other MIDI keyboards and equipment. 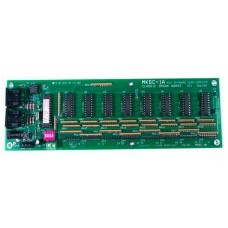 The MKSC-1B can handle power from a power supply or a standard, 9-volt DC adapter of either polarity. For keyboards wired in a 8x8 matrix, the MKSC-4A key-scan computers are available. The MKSC-1B supersedes the MKSC-1A. Converts key-switch information from a single keyboard to MIDI control data. Inputs for up to 61 notes. Convenient wiring as a separate pin is used for each key switch input. +5V switch common present. However, an organ with a +10V to +15V switch common may be used. Connects keyboards to MIDI sound modules or pipes. User-selectable MIDI Channel output on one of sixteen MIDI channels. MIDI-merge function allows chaining of multiple boards and MIDI devices. Supports MIDI-Channel messages but will retransmit MIDI system messages from the MIDI-IN port. Software ‘switch de-bouncing’ performed to eliminate switching errors in older organs.